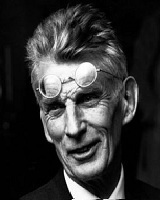 Samuel Beckett 13 April 1906 22 December 1989 Irish William Frank Beckett Maria Jones Roe Screenwriter, Poet, Essayist, Author, Playwright, Cricketer, Film director, Theatre Director, Novelist, Translator 20th century Irish novelist, playwright and poet Samuel Beckett penned the play 'Waiting for Godot'. In 1969, he was awarded the Nobel Prize for Literature. A list of popular Hindi Samuel Beckett quotes are given below.